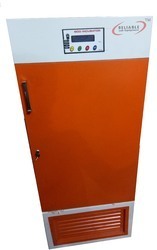 BOD incubator is an incubator designed to maintain 20 °C necessary to perform a test called Biochemical Oxygen Demand (BOD). It involves incubating samples saturated with oxygen at 20 °C for (usually) five days. 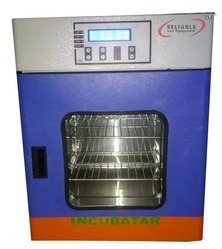 Such an incubator has a compressor to depress the temperature below ambient and a heater to bring it back up to 20 °C. These work against each other and produce very precise temperature control, often as close as +/-0.1 °C. Orbital Shaking Incubator the unit is added with a typical shaker that has a table board that oscillates horizontally, powered by an electric motor. The liquids to be stirred are held in beakers, jars, or Erlenmeyer that are placed over the table; or, sometimes, in test tubes or vials that are nested into holes in the plate. Orbital shakers also exist, that shake the vessel in a circular fashion. Outer wall is made of M.S. sheet duly finished in white stoving enamel/powder paint with mat finished colour combination and inside of stainless steel. The gap between inner and outer wall is filled with high grade mineral glass wool. Temperature range from ambient to 70oc is controlled by EGOUMO German capillary type thermostat with an accuracy of ± 0.5oC. The Unit is provided with manual tilting device, so an to tilt the tray holding the eggs to work on 220/230 volts A.C. Supply. 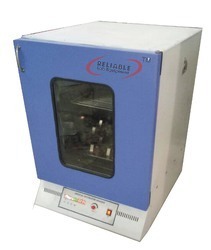 Looking for Laboratory Incubators ?